Oxides. Oxides of various metals. 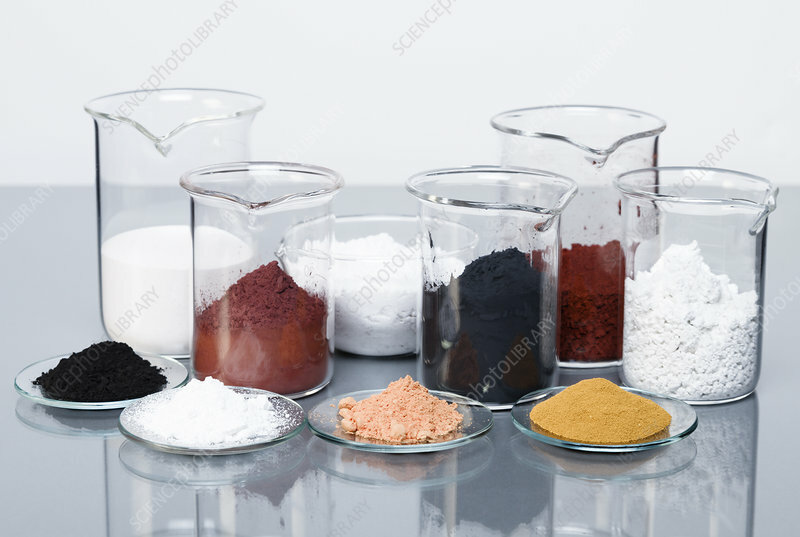 Left to right, front row in watch glasses: zinc oxide (ZnO, white), lead(II) oxide (PbO, red-yellow), vanadium(V) oxide (V2O5, orange); middle row: manganese(IV) oxide (MnO2, black in watch glass), copper oxide(I) (Cu2O, red), copper(II) oxide (CuO, black), calcium oxide (CaO, white); back row: aluminium oxide (Al2O3, white), magnesium oxide (MgO, white), iron(III) oxide (Fe2O3, red).